Keep your guests entertained during your wedding reception with West Bromwich magician David's amazing skills. 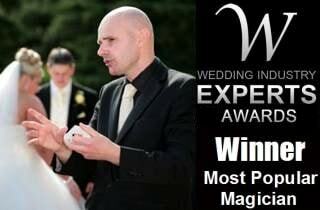 Make your party outstanding with an incredible performance by David Fox, West Bromwich's top magician. 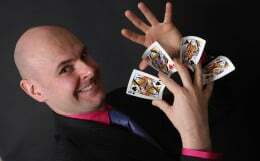 For corporate functions, trade events and product launches in West Bromwich, magician David Fox is ideal. Magician, David Fox, continues to amaze and astound fascinated audiences throughout West Bromwich, Sandwell and the West Midlands. The strength of his magic is its incredible versatility and David is proud to have performed at many of the top venues throughout the world. As a member of the Magic Circle organisation and Equity, David always maintains exceptionally high standards before, during and after each performance. He has full public liability insurance and is CRB certified. His dedication to detail and life-long commitment to his craft make him the first choice magician for private functions, corporate events and weddings in West Bromwich. He is always delighted to speak to you about your requirements for a particular event and can provide expert advice.